Well, we have officially entered into what I refer to as HallowThankMas. Generally, once Halloween passes, time becomes a blur until after Christmas. We are continually bombarded with commercials, ads, banners, emails and every form of communication possible promoting Christmas. But no one wants to forget Thanksgiving, so we still see plenty of ads for that through the end of November. 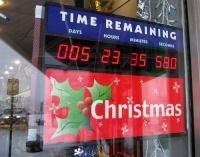 Since retail stores want to begin promoting Christmas during October, let’s just roll it all into one massive holiday. We already refer to it as the “Holiday Season”, and we can continue to do that. It’ll simplify everything, and the actual celebration days are spread out enough to prevent a lopsided experience (I know Christmas is at the end, but still). Last year was bad enough because we were finally learning that we were in a recession, so everyone wanted to start a price war. This year will be worse…Wal-Mart has already started their screaming deal advertising and everyone is trying to leak their Black Friday advertisements. Only time will tell how overstimulated we will be. In the mean time, Happy HallowThankMas! Does Pneumonia run in the family?